The other week I dropped into the Moon Under Water in Hounslow - a JD Wetherspoon that's a Good Beer Guide regular - to see a Bale Breaker Field 41 Pale Ale pump-clip. 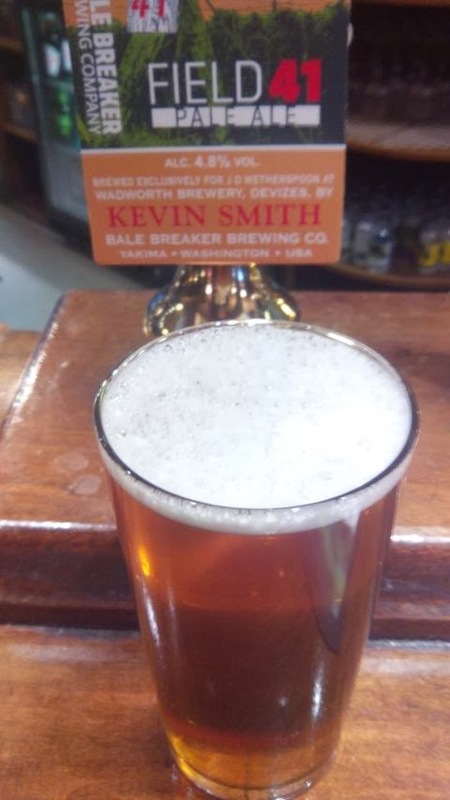 It wasn't from Yakima in Washington State though, where Bale Breaker is based, but from Devizes in Wiltshire. Yes, it was another of JDW's popular guest beers where they get the US brewer to come and do a beer at one of several UK breweries - Wadworth's, in this case. It set me thinking - are these contract brews, or are they collaborations? JDW is rightly quite clear where they come from, with most clips proudly bearing the name of both the guest brewer and the host brewery, and they are never exactly the same beer. For a start, the UK versions are cask-conditioned, whereas the US ones will mostly be kegged or bottled. Typically the ABVs will differ too - UK Field 41 was 4.8%, versus 4.5% in the US for example - and the recipes may need to be adapted. For example, Mitch Steele of Stone Brewing wrote extensively on his blog about the process of brewing a version of Stone's Supremely Self-Conscious Ale at Adnam's (5% UK, 4.5% US), which he describes as a true collaboration. The two versions used different hops and yeast - as well as different water of course. Most times though, all we have to go on is the information that brewer X brewed their beer Y at brewery Z. Does that make it a collaboration, or is it merely a contract brew, where the same recipe could be brewed, with appropriate adjustments, on any number of different sites? And do they count as different beers or as the same one? On the Untappd forums, it's been interesting to see what appears to be a geographic split on this. US voices have tended towards the "same beer" view, I guess to them it's no different from contracting your best-selling beer to a bigger brewery in order to meet demand. Maybe it's also important for it to remain "an American beer". UK voices on the other hand seem to see them as American-inspired but different and collaborative - perhaps it's partly nationalist, but it's also a recognition that the recipe and process will need to change to produce a cask-conditioned ale, and that local expertise will inevitably need to be involved.